Riding tour into the wilderness ? 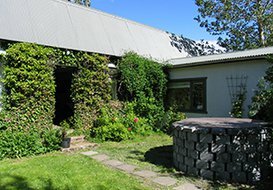 On the first and last nights you will stay at the guide’s farm, Árbakki, where your hosts Maggi and Lilja have farmed since 1994. They are both very experienced riders and tour guides, and will make sure that you will have a wonderful and unforgettable tour. You will see broad valleys, steep canyons, raging rivers and waterfalls. Take advantage of bright summer nights, see Thingvellir National Park and get close to the wonderful Icelandic horse. Meals at Árbakki and in the mountain huts will be family style, consisting of typical Icelandic cuisine, featuring dairy products, fish, lamb, and potatoes. 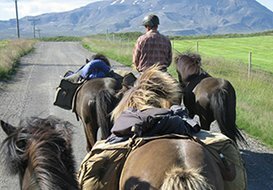 This tour is undertaken in the traditional manner which means that you and the horses will carry all your belongings. It is therefore important that you restrict your luggage to the basics. All extra luggage can stay at Árbakki until you return. 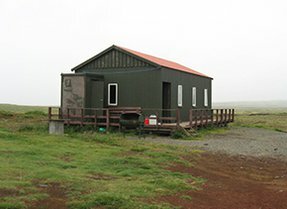 (Pick-up at the airport or from your accommodation in Reykjavík). A nice dinner and a good night’s rest awaits you at Árbakki before you start riding on day 2. This part of the tour is very spectacular. Here we ride at the base of the magnificent Mount Skjaldbreið through volcanic land-scape on lava and sand to Gatfell.